For Hellenism, August is the month of the Panagia. According to Greek Christian tradition, the person of the Panagia is closely linked with the expectation of the healing of a person from human pathologies. The Dormition of the Theotokos is one of the biggest celebrations of Christianity, and in Greece it is celebrated from one end to the other with great brilliance and reverence. Thousands of believers with their soul full of hope and devotion, run to countless shrines, where miraculous icons of the Panagia are processed, to testify of their faith in her person and to beg her intercession to her Son for their souls, since, according to religious tradition, the Panagia shortly before her translation to the Heavens, promised that she would not cease caring for the entire world, and that she would become an "intercessor" to her Son for the salvation of mankind. Panagia Soumela is one of the important centers of Pontian Hellenism. From its founding until today it has been visited by millions of believers from around the world seeking her grace, while the procession of her icon which is done with Byzantine solemnity is considered one of the most moving services. The Panagia of Tinos. The icon of the Panagia of Tinos was found on January 30th of 1823, after several attempts and at the suggestion of the Panagia to the nun Pelagia, at the historic Monastery of our Lady of the Angels, in Kechrovouni. The road leading from the harbor to the Church of the Annunciation, where the icon was found, is the greatest proof of the indissoluble relationship of Hellenism and Orthodoxy. This road is the place where countless thousands of people every year place their hopes and faith as they go uphill on their knees in order to reach the church and venerate her grace. The Panagia of a Hundred Gates (Ekatontapyliani). The Church of Panagia Ekatontapyliani is located in Parikia, Paros. The all-revered Church of a Hundred Gates in Paros is one of the largest sacred shrines not only in the periphery of the Metropolis of Paronaxia, which it is under, but in the whole country of Greece after the community of Mount Athos. 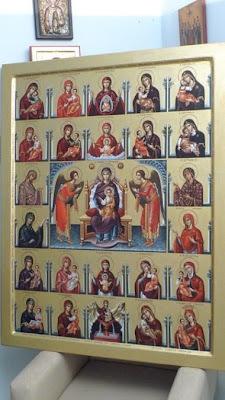 The sacred icon of Panagia Ekatontapyliani is a work of the 17th century and is the second most revered icon of the Cyclades after the sacred icon of the Panagia of Tinos. The Snakes of Kefallonia. Every August 15th inside and outside of the Church of the Panagia of Lagouvarda (or Panagia Fidousa), near the village of Markopoulo in Kefallonia, snakes appear, which the faithful call "snakes of the Panagia", and are considered very lucky. According to tradition, if a snake doesn't appear, it is a bad sign. This happened in 1940, as well as 1953, when the island underwent earthquakes. Panagia Agiasotissa. In the hinterland of Lesvos, in Agiaso, August 15th is a different experience for everyone. The icon is the work of Luke the Evangelist, modeled in wax and mastic. Many of the pilgrims walk 25 kilometers overnight from the city of Mytilene to the courtyard of the church. The Monastery of Panagia Giatrissa is built on a ridge at an altitude of 1,000 meters. It is dedicated to the Nativity of the Theotokos (Sept. 8) and is built on the ruins of the ancient temple of Athena Giatrissa. Inside the monastery one could distinguish components of the ancient temple. Panagia Koufi is in Samothrace, and she is so named because she is considered to treat people with hearing problems, and in Serres is Panagia the Nursing (Lehousa), who is believed to protect nursing mothers. Panagia Giatraina is located in the Medical Museum at the university campus of Ioannina. The icon is a representation of twelve medical miracles of the Panagia. And there are many other shrines of the Panagia throughout Greece, where believers place their hopes for their health. Since the Panagia is closely linked with the expectation for treatment, many chapels in places of health/hospital institutions are dedicated to the Panagia, and many institutions/clinics are named after her. In our days, around 3-4 billion people worldwide believe in a Divine power and the effect of prayer to achieve treatment. There are many recorded cases of healings, which are attributed to Divine intervention. Besides, all religions acknowledge the existence of Divine intervention to restore health. There are sick people treated despite the fact that science has given them no hope of recovery. The French doctor Patrick Theillierte established seven conditions which can be applied to judge a miraculous cure. First, the disease should be known and documented. Second, it must be serious, able to endanger a sick person' life. Third, there is measurable organic and bodily harm, an essential criterion to exclude a case of mental illness. Fourth, there must not have been any type of treatment applied in the interval, which could play an important role in the healing process. Fifth (a point of particular importance), the healing should take place suddenly, from one moment to another. Sixth, the cure must be complete, not partial, allowing the sick person to return to a state they were in before they fell ill. And seventh, the cure must be permanent. In recent years, it is true that more and more experts argue that it would be appropriate for the mental/spiritual aspects of man to go to the foreground, without this leading to any form of devaluation of the achievements of modern medicine and technology. These findings suggest that prayer and meditation can help to restore health. The sick person does not need to know specific prayers, nor the profit of prayer from a specific religion. It cannot be predicted if scientific research will achieve to analyze the true nature of the soul or the mental dimension of man. However, the effect of spiritual processes in mind and body have already begun to be recorded.